WASHINGTON -- First Lady Melania Trump thanked former first daughter Chelsea Clinton for defending President Donald Trump's young son, Barron, after a conservative news outlet criticized the boy's T-shirt. 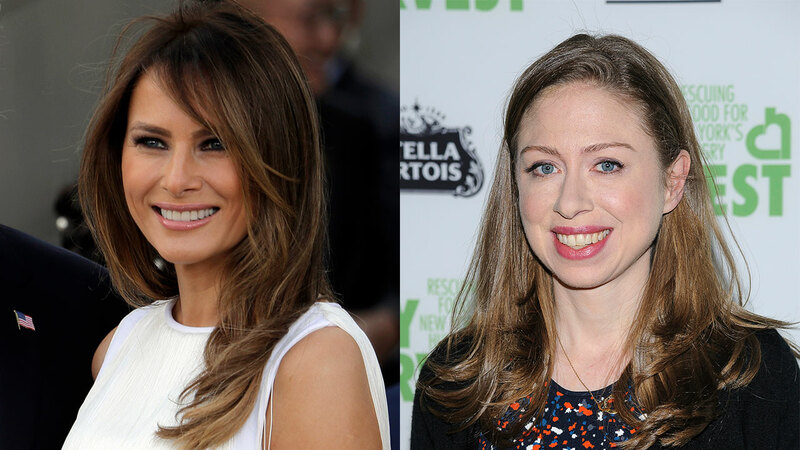 "Thank you @ChelseaClinton," @FLOTUS tweeted. "So important to support all of our children in being themselves! #StopChildhoodBullying"
The hashtag was a reference to her promise to work as first lady to combat cyberbullying. Earlier this week, The Daily Caller columnist Ford Springer called out the 11-year-old for wearing shorts, a T-shirt that said "On Your Mark Tiger Shark" and loafers without socks for Sunday's return trip to the White House from the family's home on Trump's private golf club in central New Jersey. Trump wore a suit and tie while Melania wore a sleeveless, calf-length yellow-and-white dress. Springer wrote that since Barron doesn't have any responsibilities as the president's son "the least he could do is dress the part when he steps out in public." "While the president and first lady traveled in their Sunday best, young Barron looked like he was hopping on Air Force One for a trip to the movie theater," the column said. In response, Clinton defended Barron on Twitter. "Barron is A KID. No child should be talked about in the below manner-in real life or online. And for an adult to do so? For shame," Clinton tweeted Monday. Clinton was the subject of ridicule as a teenager growing up in the White House in the 1990s when her father, Democrat Bill Clinton, was president. Earlier this year, Clinton also defended Barron after he was the target of a joke by a "Saturday Night Live" writer. The writer was later suspended. The Associate Press contributed to this story.